Who doesn’t love a good deal? 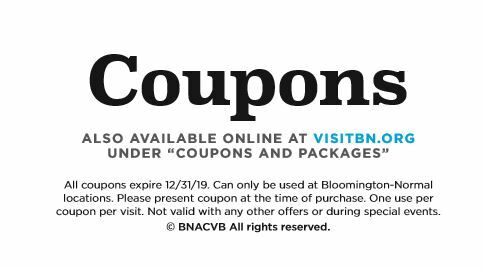 The Bloomington-Normal Area Convention and Visitors Bureau wants to ensure that visitors have the best experience possible when they visit our area. We have created two pages of coupons for discounts at local restaurants, shops and attractions. These are located in the back of our visitor guide and are also available to download off of our website, VisitBN.org. We also encourage hotels to post packages on our website. Read more below to find how the great deals that are happening here in BN! – If you’re looking to add a little romance to your stay, choose the Romance Package. This option will include a free bottle of Canvas wine, a $25 Hyatt Place food and beverage gift card of your choice and a late checkout time of 2pm! – Their Weekend Getaway Package includes one bottle of champagne upon check-in and a $50 gift card to Medici. – BN’s major golf courses: The Den at Fox Creek, Prairie Vista and Weibring Golf Club all offer specials. For more information on our coupons and packages, call us at 309.665.003!